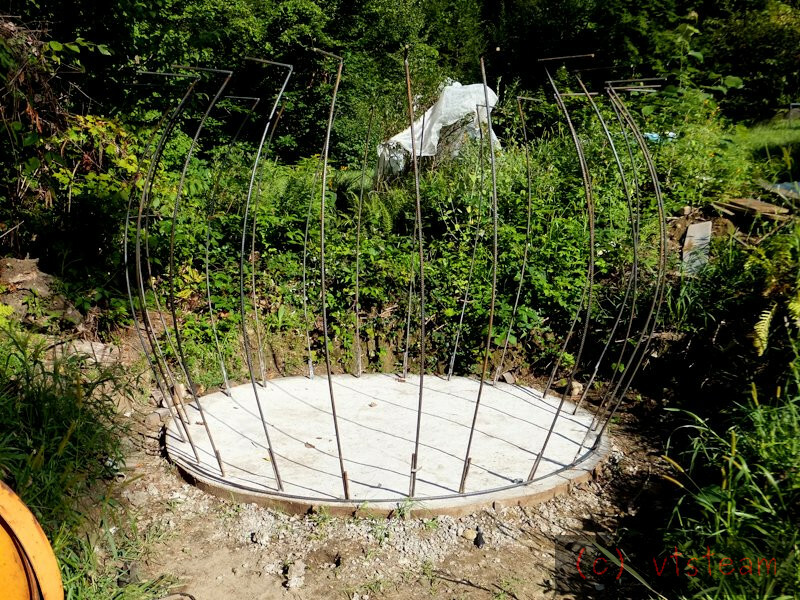 Following onto Andrew's thread about his pig house construction interfering with his shop time, my time now is mainly going into building a summer drought cistern. I'm continuing since, even though it's been raining lately, the streams still look low to me now, and it is very early in the year for that to happen. Our water comes from a spring coming out of a small round hole in solid rock ledge. It's been tested and approved by the state testing laboratories and normally feeds a 200 gallon cistern under the house, which is constantly fed and then overflows through a pipe. A shallow well pump takes the water from the small cistern and pressurizes to domestic pressure on demand. There's a 20 gallon pressure tank in the system so the pump doesn't run continuously. Everything works well, the water is delicious, and cold right out of the spring, and though we've considered putting in a well in the past, the cost of $10,000 or more, and the prospect of not so good water (some nearby wells have sight rotten egg flavors) has made us reluctant to part with our genuine "pure mountain spring" water. We actually get compliments on it from visitors. The plan is to build a cistern of about 3000 gallons capacity to enable us to weather a drought in late summer. There's always plenty of water in winter.....late summer can pose a problem on exceptionally dry years -- as it does also for some wells in the area. The cistern will be emptied for winter. The amount of water produced by the spring is huge over the course of a year since flow is slow but continuous, and filling a reserve cistern would be easy with the overflow pipe from the present house cistern. So anyway, on with the plan. I want it to be shaped like an urn or jug to fit in with the garden, rather than just a utilitary looking tank, and construction will be ferrocement. As a reference I'm using Art Ludwig's book "Water Storage" as a guide The book shows small photos of the construction of one urn shaped tank, but it isn't very detailed, so I'm having to wing it and guess at quite a bit of it. 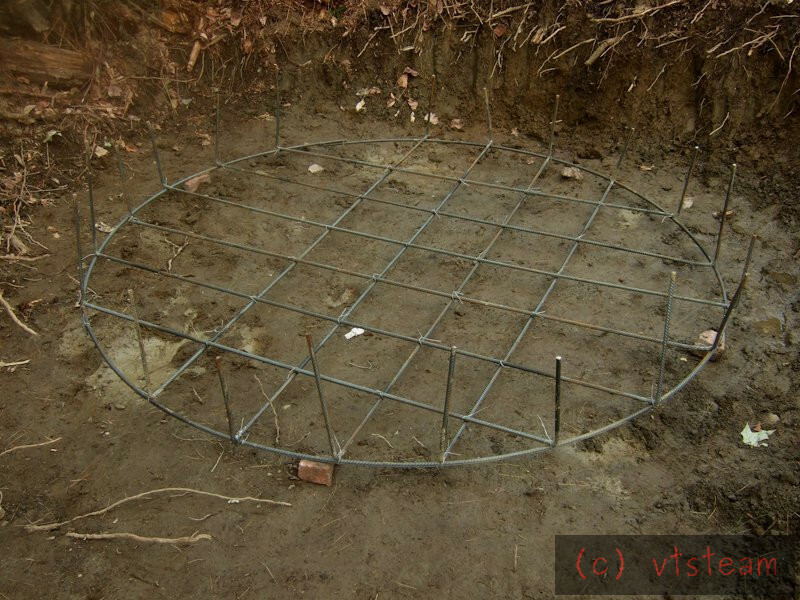 The photos also show two shallow trenches dug after the fact of placing rebar, to provide shallow grade beams on a 4" (I believe) concrete base. I will be going with a 6" thick concrete base with no grade beams. I don't like rebar so close to the outer faces in a wet area, and the construction already seems massively stiffened for the purpose. Actual load is probably going to be in the neighborhood of 600 lbs/sf, and I'm on very good compacted iundisturbed subsoil -- I'm sure bearing is better than 2k lb/sf. Emptying in winter I assume Steve due to likelihood of freezing? How far below below surface would it need to be not to freeze? Steve, I seem to recall from the trouble you had getting access initially, that some parts of the ground were damp. Just a small question - is there a danger of your ferrocement "hull", when fully ballasted-down, moving due to any local gradients? I wasn't real comfortable with the exposed upright rebar like that so first thing this morning i made some blocks from scrap hardwood, drilled them and put them over the ends. There are commercial plastic versions available but I don't have any. Andrew, yes, I don't need extra capacity in winter, and keeping a full tank freeze free in -10F temps could be a challenge. I'll put a srone retaining wall around it, but with a walk space between. This is slightly graded to allow runoff. Unles the hardpan heaves I don't think the cistern will shift. It could happen however, and the design should be able to handle that, especially empty, without cracking (I hope). It should then settle back in spring, if it moved at all. Interesting thing about Vermont farmhouses -- they were usually built on a dry laid rubble rock foundation and moved in winter If they did) as if on ball bearings, resettling in spring. Then in modern times people decided to mortar the foundations to lmake them "stronger" and look nice inside, dig out cellars, and or add poured cellar walls. Then had major problems with cracking sills, and foundations falling apart, uneven support stressing structures, water ingress, etc. So your analogy to a boat hull is not a bad one here. If we keep it intact, assuming it moves, and design our piping to disconnect, and drain the ground around it, movement can probably be eliminated,and if not, tolerated rather than fought against in a losing battle. No guarantees, but that's the philosophy -- we'll see. I've never found that fighting against nature was an easy task, generally I try to let it win without a challenge, and try to fit in. Even though this is a distraction, I still find the idea pretty interesting (same with Andrew's distractions). They both definitely fit in with the theme of madmodder for sure. Concrete itself interests the hell out of me. I have been researching it's unusual uses.... Found it in everything from backyard tables, shop benches and even boat hulls! Some of the more interesting things have been full CNC mills made out of a concrete mixture. I will be watching you build this with enthusiasm. I wonder if we should bottle it? There was a concrete lathe in an old issue of ME that I once read. It was pretty cool -- I'll have to find that again..
Well, now arranging for delivery of 3/4" stone and mason sand (sharp). I'm getting 5 tons each to have extra on hand for projects. Update we had a one day rain, so no sand and gravel delivery (truck must climb over grass slope), then a clear day, and then two solid days of rain again and it's raining still. Construction halted. Classic! I shoulda just dug a pond instead! Seems we have not had two days straight without rain until day before yesterday when we finally got some drying weather. So yesterday morning at 7:00 A.M. bright I was at the door of a nearby building supply and picked up 6 bags of Portland cement. By 9 A.M. I was back and had a few tractor loads of sand and gravel by the mixer, hose and extension cord in place, wheel barrow and shovels, and I started mixing. 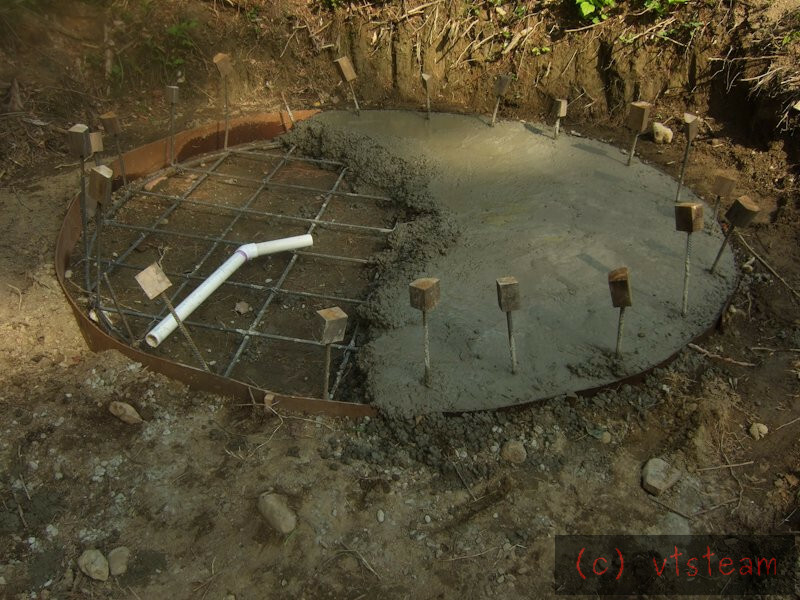 The pad is 6 inches deeep and 105 inches in diameter and i had figured I'd need about 30 cubic feet to fill -- a little over a yard -- of concrete to fill. I was using a strong mix of 1:2:3 and I'd estimated f1ve 94 pound bags of Portland would do it. I bought 6 just in case. This photo was taken when I realized I'd never make it. Gee you're halfway done she said! Finally at about 7:30 I poured my last load -- I had to use up all 6 bags of cement, and bring up many bucket loads of sand and gravel. I had exactly enough with the 6th bag to fill the form. Not an ounce too much -- I was getting worried toward the end. But it was done. Cleaning tools and mixer took me to 8:00 P.M. A look in the mirror showed me looked like a mud man. Completely gray with two bloodshot eyes poking out. I was one hurtin' puppy. Probably a couple ton of concrete mixed and hand placed byt the time I was done, every shovel full, because I couldn't wheel around the form. 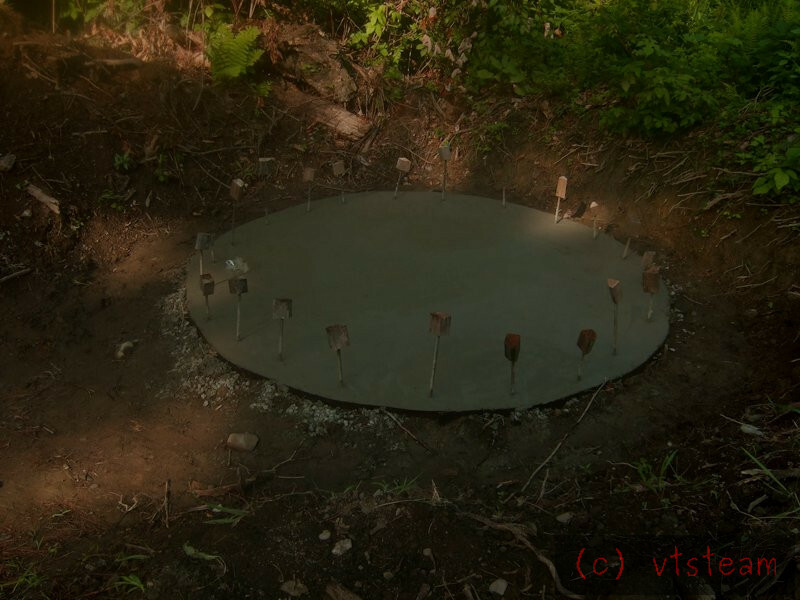 The barrow wheel would press the fill in and distort the masonite form. Luckily I figured that out in the first five minutes before any real damage ocurred. But man, that was hard work, walking a shovel around and mixing alone. I was happy to take a shower, eat, and go to bed. I think a yard of concrete is probably overdoing it for me these days! Not much when delivered by a mixer truck, but since they can't reach us here, I always pour my own. Several times in the last twelve months I've had jobs for concrete that are too small to get it shipped in mixed, and every time I vow 'never again' but don't learn ! The worst recent one was filling hollow brick pillars in those pig pens. It takes far more than you expect and in that case every bit had to be lifted to five foot high and poured carefully so not to mar the brickwork. Still your slab has come out nicely. 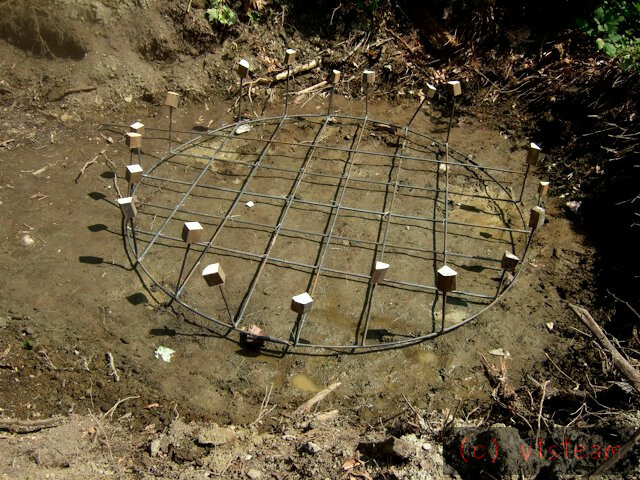 Remind me is the concrete going to be water retaining or are you lining it all when you've built the sides? Once I had to fix bathroom/washroom/sauna/WC and it had damaged floor. I had to pour the floor on one go and I had all prepartoins done in before hand. I had a small concrete mixer and to make things easier I ordereder those readymade bags of concrete (just add watter). I knew I could not do it all, therefore I called two frieds and my father to help me out. It was just about possible. 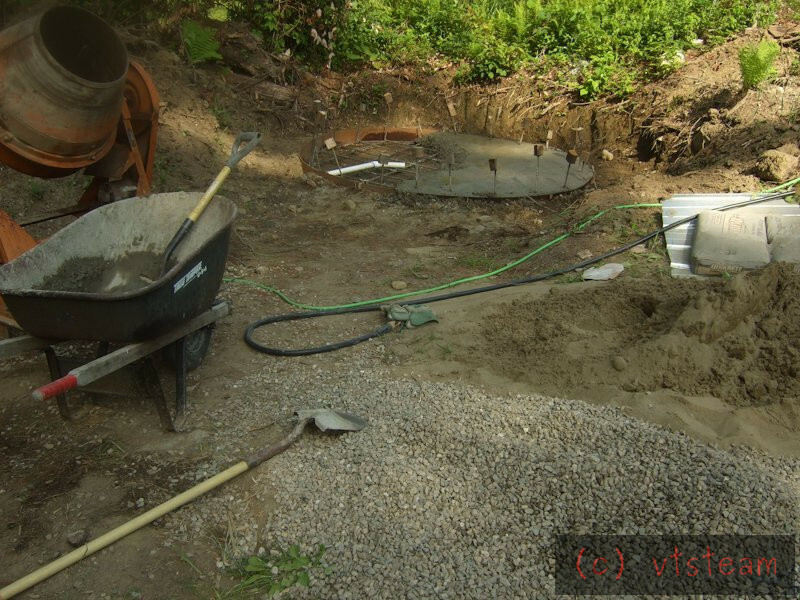 One was using the whell barrow to bring the dry concrete into the mixer, one handling the mixer and wheeling the mixed concrete in, me showeling it and father compacting and leveling it. Took all day. Once I desided to pave patio with cocrete tiles. I was rainy summer. I had all prep done and I had planned using two or three days to pave it. Weatherman said that only dry day in weeks would be "tommorow". I woke up at dawn, wife left to work, returned, fed me and sun had gone down when I had finished carrying and laying five pallets of concree tiles. I took a shower and drove a shop to get a beer. One diaper vandal jumpped the line and was being obnoxos and I was that tired that I even hadn't any smart cracks to it. I was sure tha if anything touches me I'll shatter. Hope you are fine today and you don't feel suddenly very olod on the morning. If I did that I would sound like a bowl of serial. Andrew, Pekka, I was definitely hurtin after that one, and into the next day, too. My mixer is getting on in age, too, and bogs down if you do a lot more than a cubic foot at a go, so that was part of the problem. So many loads! Plus I was trying to be real good and keep the mix stiff -- without over watering it. But that makes it a lot harder to scoop out out the wheel barrow, and place, etc. Plus walking around the form with each shovel full. Definitely didn't make it easy. One good thing though -- mixing with piles of sand and stone is a lot better than lifting and pouring in those bags of dry pre-mix. I'd probably needed 40 or 50 of them by the time I was done! Shoveling loose ingredients into the mixer is a lot easier, I think. Andrew, I know exactly what you mean about filling columns. I once built a HAHSA outdoor furnace, and that thing had 8 foot concrete block walls with rebar in every other block space all the way up, and those were filled with concrete -- it takes a LOT of buckets to do that on 44 linear feet of 8 foot tall wall. Luckily that time I had a helper. But it took us a very long day to do it. The new tank won't have a liner, the ferrocement walls hold the water in. Hi Vtsteam, I can sympathize some with your pain. I recently replaced a toilet pan (bowl) and cistern for my daughter. Nowhere near the shovel mixing you had to do. It was just the constant up / down movement whilst removing the old broken pan. Then because the replacement was of different design it was up and down some more cutting the old fittings off the waste then fitting new to extend the reach. Finally ready to install everything and it went ok. Mind you it turned out to be a 7 hour job instead of three. The following morning I could hardly move - found aches in muscles I didn't know existed. At almost 74 orbits round the sun there will be no more of that much exercise. Well fast forward two months and I hadn't done anything more on the cistern -- the reason? Plenty of rain all summer and no need. But things have been getting drier this month, and I noticed the kiddie pool wasn't filling overnight from the overflow from th spring, so I figured I'd better get back on it. Thanks Andrew. Well I hope it will look good after I finish the reinforcement and plaster it, but no telling -- i've never done this before! A little trepidation about the plastering, but onward and upward! Are you planning to build it like a ferro-cement boat hull, using mesh and rendering it, or are you using cut blocks? 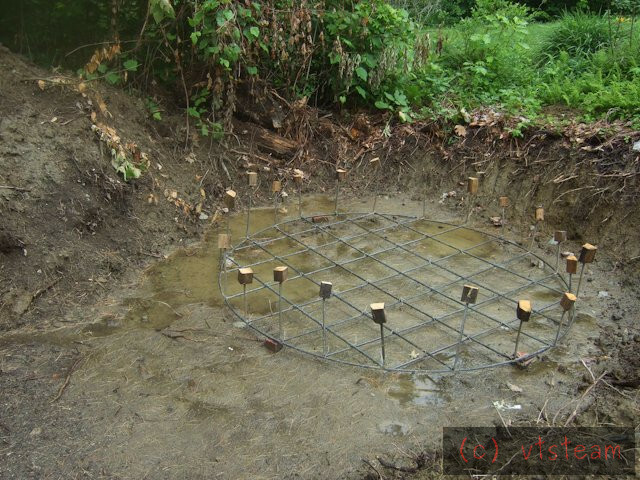 It will get horizontal rings of rebar decreasing in spacing toward the bottom to take the hoop stresses and increasing head pressure, then one layer of expanded metal lath and one of chicken wire to shape and hold the cement plaster. Three layers of sand/cement plaster to finish about 1-1/2". Two issues I see are dealing with the lath sheets conforming to curves in 3D, and the first coat plastering probably working alone. Friends have offered to help, and I may have a mixer helper (though maybe not) but if it's going to come out an unfair leaky mess, I want to be the one responsible for it! If a 60's style singer shows up, I may leave it as-is for the duration of the act! We find few of them wandering through these woods however. Steve, I researched ferro-cement boats decades ago, well before the interweb. The received wisdom then was that you need someone on each side for the first coat as the 'outside man' tends to push the pug all the way through, so needs an 'inside man' with a float to push against. Andrew, was this the way that the 'Fire barges' were built for the London Blitz? I certainly recall a couple on the River Tyne. I'm too busy to look at the 'box' but I caught a glimpse of someone pouring cement overhead onto a skeleton frame covered with a tarpaulin. Maybe it was TF1 from France. I fell asleep!!! Having seen the intriguing shape of the structure I was wondering how Steve was going to finish off the inside, or more importantly (perhaps ) how he was going to enter and exit the shape, so I remain an avid reader..